From iPhones and iPads to autonomous vehicles, Apple has got it’s hands busy. Apple initially had its plans to make its own self driving cars and be a pioneer in the next generation form of transport. But since those initial plans, things have changed. At first Apple concentrated on making their own software for autonomous vehicles and then it moved on to making autonomous shuttles for their employees. Next came, Apple’s decision to join with an auto partner in making self- driving cars. Apple’s initial choice had been BMW and Mercedes- Benz but talks with both companies broke down and nothing went further. So now Apple has joined hands with Volkswagen to transform Volkswagen’s T6 Transporter vans into Apple’s self- driving shuttles that they use for their employees. Apple’s four year plan to make self- driving cars has not been easy sailing. Apple’s breakdown of talks with other auto manufacturers and the fact that Apple- Volkswagen talks have previously not been made public suggests that the program may not be free from worries. A lack of clear direction and morale has pushed many people working on the project to call it quits. Roughly around 1000 members of the team have quit. These factors have pushed Apple even further in the race for self- driving cars. Already Waymo, a business started from Google and some start- ups have already started testing out autonomous vehicles on the road. While some of the autonomous vehicles have been successful, others have discontinued the programs leading to major layoffs. Apple initially took the wheel of self- driving cars back in 2014 with Titan and T172. Apple had plans of coming out with its own self driving car which would be the car version of an iPhone. According to former employees working on the project, Apple had plans of making a plush interior filled car and seats facing each other instead of the front. Apple took on software engineers, programmers, rocket scientists, automotive engineers, designers and the like to bring to reality their autonomous car. Some of the ideas include holographic displays on the windshields, a sun proof roof made of polymers to reduce the heat from the sun and windows with adjustable tints. Apple had invested in hundred and millions of dollars in R&D labs around Cupertino including machine shops and labs that dealt with electric car batteries. Apple soon found out that building an autonomous car was not child’s play. After experiencing a number of hurdles regarding the autonomous driving program, Apple soon decided to partner up with an auto manufacturer to build the cars but not design them. Apple soon went in for talks with various auto manufacturers to bring their autonomous car plan’s to fruition. But none of them worked out until Apple came across Volkswagen. 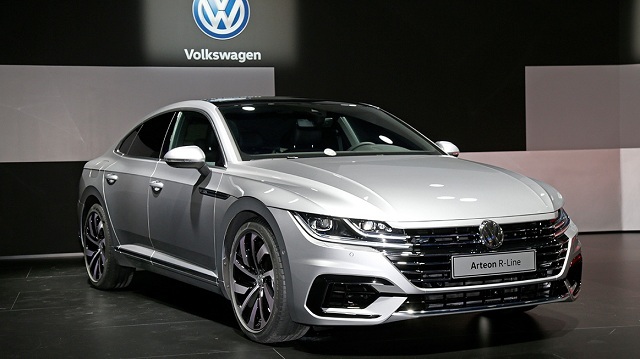 Volkswagen too jumped at the opportunity to work with Apple. Apple had been granted permission recently by the California Department of Motor Vehicles to publicly test the autonomous driving technology on the Californian roads. A new document of Apple has come up detailing the self-driving car training program for drivers. The new document offers more evidence that Apple is actively operating on autonomous driving technology internally. The official papers were obtained by Business Insider entitled `Development Platform Specific Training’, which tends to refer to the `Apple Automated System’, utilised in self-driving vehicles. Apple had established an `Automated System’ for self-driving vehicles and intends putting select staffers through a training program in order to control the vehicles. As per the documents, the drivers of Apple need to pass seven various tests before their complete training. Every driver is given two practice runs together with three trials in order to pass each test which is said to be a private course. 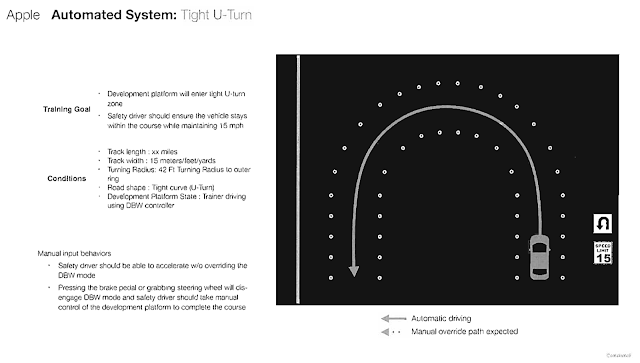 The documents specify that the technology utilised by the drivers comprise of Logitech hardware as well as basic driving schemes such as tight U-turns with sudden braking or acceleration. Every test includes a goal together with steps to supersede the autonomous system while training with the scheme. Though Apple has the liberty to test anything internally and privately, it is the California permit that enables it to test three 2015 Lexus RX450h hybrid sport utility vehicles as per the DMV documentation that had been published recently, which is the same vehicle utilised in the self-driving tests of Google. Though it had been presumed for some months that Apple had been constructing its own electric vehicle, the recent rumours have claimed that presently Apple has been focusing on self-driving car software instead which is shown by the latest public-facing development. A letter to the U.S. National Highway Traffic Safety Administration in December had shown that disclosed first hand work on self-driving technology of Apple. Self-driving car technology is said to be one of the most prominent arenas in Silicon Valley. Earlier known as self-driving car unit of Google, Waymo is presently in a high-stakes combat with Uber over its autonomous car tech and analysts have estimated that the industry could be worth trillions of dollars. Apple had refrained from commenting on this issue. For the past three years the work of Apple had been something of an open clandestine and the company initially had intention of creating its own autonomous vehicles. However it turned to an autonomous driving software platform resulting in internal strife and leadership problems. The company is now creating a driving system under the management of Bob Mansfield wherein the car team have been given till the end of this year in order to substantiate the possibility of self-driving car platform. Such a type of structure would probably permit Apple to partner with car manufacturers as a type of development of CarPlay. Apple being ready in testing the software on public roads shows that the development seems to be fairly far-off. If the company tends to take the vehicles out on the streets of California, its works would require to be publicly shared with the DMV established on the law of California.